U.S. troops returning from West Africa are being placed under isolation at a base in Italy, even though none of the soldiers has symptoms of Ebola, as a precaution to prevent the potential spread of the virus, the Pentagon said on Monday. The U.S. Army has isolated a dozen soldiers returning from West Africa, including Major General Darryl Williams, who oversaw the military's initial response to the Ebola outbreak in Liberia, the Pentagon said. 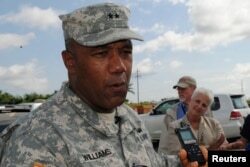 FILE - U.S. Major General Darryl Williams speaks to journalists at the Roberts international airport outside Monrovia, Oct. 9, 2014. Dozens more troops would be isolated in the coming days as they rotate out of Liberia and Senegal, where the U.S. military has been building infrastructure to help health authorities treat Ebola victims, the Pentagon said. "Out of an abundance of caution, the army directed a small number of personnel, about a dozen, that recently returned to Italy, to be monitored in a separate location at their home station of Vicenza," Pentagon spokesman Colonel Steven Warren told reporters. In all, there are now 700 U.S. troops in West Africa, including nearly 600 in Liberia and 100 in Senegal. The force is due to grow to at least 3,200 troops in coming weeks and possibly as large as 3,900. Meanwhile, the U.S. ambassador to the United Nations called attention to the need for a greater response to the Ebola outbreak that has killed nearly 5,000 people in West Africa. Samantha Power posted on Twitter early Monday, after spending a day in Guinea, that the "scale of need is staggering" and that the "most basic resources will help save lives." She is on a multistop tour this week of the worst-hit countries, including Sierra Leone and Liberia. She flew to Sierra Leone on Monday and will also visit Liberia, the two other countries most affected by the Ebola epidemic. Power highlighted the efforts of those already working in Guinea to treat patients, build treatment facilities and educate people, including Doctors Without Borders and the U.S. Centers for Disease Control and Prevention. She participated by video Sunday as President Barack Obama met with his public health and national security advisers to discuss what the White House called "appropriate measure" to contain the spread of domestic Ebola cases. The meeting follows moves by the U.S. states of New Jersey, New York and Illinois to impose mandatory 21-day quarantines on U.S. health workers who have treated Ebola patients abroad. U.N. Secretary-General Ban Ki-moon on Monday blasted the latest restrictions on travelers from countries hit by the Ebola virus, saying they created difficulties for health workers who are risking their lives in the battle against the deadly disease. Ban "believes that these restrictions have put particular pressure on health care workers and those who have been on the front line of the Ebola response," said his spokesman, Stephane Dujarric. He acknowledged to reporters that the statement covered new quarantine rules for New York and New Jersey. "Returning health workers are exceptional people who are giving of themselves for humanity," Dujarric said, citing the views of the U.N. chief. "They should not be subjected to restrictions that are not based on science. Those who develop infections should be supported, not stigmatized." On Sunday, New York Governor Andrew Cuomo revised that state’s quarantine policy on health care workers who return to the United States after treating Ebola patients in West Africa. Cuomo announced that medical personnel who show no signs of the potentially fatal virus would be allowed to remain in their homes for a 21-day period, and would be monitored twice daily by other health care workers during that time. Cuomo's revision came just two days after he and Governor Chris Christie of the neighboring state of New Jersey jointly announced a mandatory 21-day quarantine of medical personnel who had returned from working in West Africa. Shortly after Cuomo's announcement Sunday, a spokesman for Christie released a statement, saying New Jersey's policy also allows at-home quarantines. Elsewhere in New York, a 5-year-old boy who arrived from Guinea was being observed in isolation at Bellevue Hospital in New York City for possible Ebola symptoms, according to media reports. The boy, who arrived in the United States on Saturday, had a fever of 39 degrees Celsius (103 degrees Fahrenheit), ABC News reported. He was not tested for the virus and was not under quarantine, ABC said, citing New York City health department officials. The New York Post said the boy had been vomiting and was taken from his home in the Bronx by emergency medical workers. A nurse quarantined in New Jersey following exposure to Ebola has been cleared for discharge, after the governor agreed that she could finish her quarantine at home in Maine. Christie announced on Twitter Monday that nurse Kaci Hickox does not have any symptoms of Ebola and may confine herself at home until her 21-day quarantine is complete. Hickox returned Friday from a stint treating Ebola victims in West Africa. She became the first person quarantined under New Jersey's new policy that requires health care workers returning from West Africa be hospitalized for 21 days upon their return. Hickox, who has tested negative for the virus, has threatened to challenge her quarantine in a lawsuit, saying it violated her constitutional rights. A lawsuit is now unlikely, her attorney said on Monday. "She was quietly happy," said attorney Steven Hyman, who said he had spoken to the nurse by telephone. "She wants this part of her ordeal to be over. She wants to return to her life." The Obama administration and medical experts have criticized the quarantines as excessive. Dr. Anthony Fauci, the director of the U.S. National Institute of Allergy and Infectious Diseases, told CNN Sunday that the best way to protect Americans is to stop the Ebola outbreak in Africa. Fauci said one of the best ways to do that is to help health workers who go there, rather than take measures that may discourage them from helping. The White House said that domestic precautions must be guided by "the best medical science" rather than political considerations. The virus has killed nearly 5,000 people in Guinea, Sierra Leone and Liberia.